Today, when you order "Double Sided Coin", you'll instantly be emailed a Penguin Magic gift certificate. You can spend it on anything you like at Penguin, just like cash. Just complete your order as normal, and within seconds you'll get an email with your gift certificate. 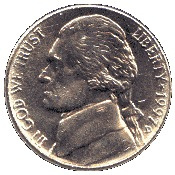 Double Sided Coin (U.S. Nickel - Heads) No matter what, you win! If you need to have one of these with the same date on both sides, just talk to the staff in Customer Service. They were happy to get me just what I needed. This is one of those items that is inexpensive but can pack a huge punch in your routines. It all comes down to you being able to present an entertaining routine. Thanks Penguins. One side has one date, but the other side has another different date, so you can't perform some kind of prediction tricks when date is involved. The quality is ok, it's made with real american coins. There really isn't a whole lot to say about this. It's pretty plain and simple. IN fact, this was probably one of the first little props I ever bought. I had fun with it then and I'm still rocking with it. You can pull a really fun gag on your friends, or even use it in a mentalism routine. Maybe get a few of these and predict the outcome every time :p all in all, I would say get it if you have a few extra bucks to spend. the only problem is the size of it. These Double Sided coins are cheap, but don't let that deter you from buying them. These are INCREDIBLY high quality. These have a seam that can't be seen from the side; these double headed coins are really nice.